The sun shone on Stephen’s Summer Steaming Sunday last. A BBQ, train rides, tennis or croquet all helped to make the afternoon a special time for our members, families and friends. 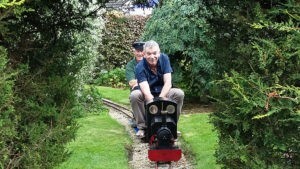 Even President Alan was entrusted with being the train driver, which he did with much aplomb. As well as a fantastic social afternoon, the event raised over £500 for Rotary Foundation. Having fun and helping others is truly a Rotary activity.